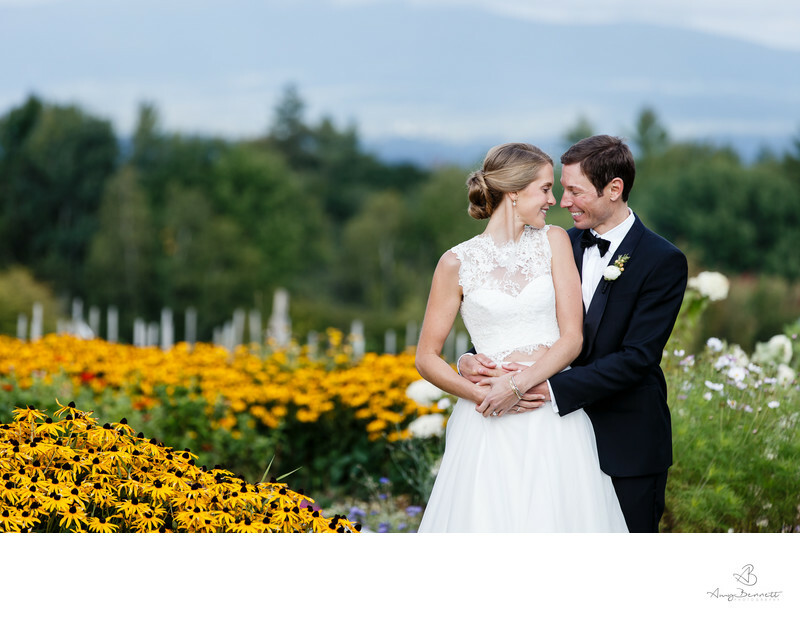 This is a stunning portrait of Brandon and Natalie in the flowers in the gardens at Trapp Family Lodge in Stowe, Vermont. They had an incredible Trapp Family Lodge Wedding. We were so very lucky with the lighting on this wedding day. It was complete overcast with intermittent rain. This might not be a brides idea of a perfect wedding day, but this photographer was thanking my lucky stars. The clouds meant that I could photograph anywhere and not worry about the shadows that harsh sunlight creates on my subjects. We could play around in the gardens and capture photos from every angle. It was super fun! Especially, because Brandon and Natalie were up for anything. They are a very special couple. I am very lucky to call Brandon one of my oldest friends. We were in the same class at a small ski academy in Waitsfield, Vermont called GMVS. We graduated with only 16 students in our class! Natalie is also a former ski racer. So their wedding was a reunion of sorts. Full of old friends. Branden and Natalie’s Trapp Family Lodge wedding showed me once again how gorgeous weddings in Vermont can be! I used to live in Stowe, Vermont, but this was the first time that I had photographed a wedding at Trapp Family Lodge! Photographing a wedding at a new location is always so fun, because you see the venue with fresh eyes. From the moment, you walk onto the property, you are looking for special places to photograph the couple. Special places where the light is beautiful, and the background is equally as nice. There are a ton of great wedding locations in Vermont but having the opportunity to photograph weddings at different locations is amazing. Wedding Clients often as me for my opinion on wedding venues in Vermont. Which locations I like the best and why. As I write this in 2018, I have only had 2 full seasons of photographing weddings in Vermont.I have completed 8 years of wedding photography in Mexico and California before returning to Vermont. So, it is GREAT to book weddings at new locations. Especially, when the location ends up on my list of recommended Vermont wedding venues.I get such a kick out of photographing weddings at new locations. It is so good for the creative spirit to be able to explore new locations. The capacity of the Trapp Family Lodge is 250 people. If you wish to have a smaller and intimate wedding, the minimum guest you need to have is 30 people. The main lodge is an excellent place for wedding ceremonies, but bridal showers, lunches, etc. can also be setup here. The Trapp Family Lodge has five spaces that you can book for your wedding; the Mozart Room, the Croquet lawn, the Wedding Meadow, the Concert Meadow and the Main Dining Room. Each location has its perks. You can discuss each site with the wedding coordinators. They will help you pick the best one according to your budget and needs. The Trapp Family Lodge overlooks the beautiful Green Mountains. You can imagine how fantastic the view is! Maria Von Trapp was a smart woman to pick such a beautiful piece of land for her lodge. 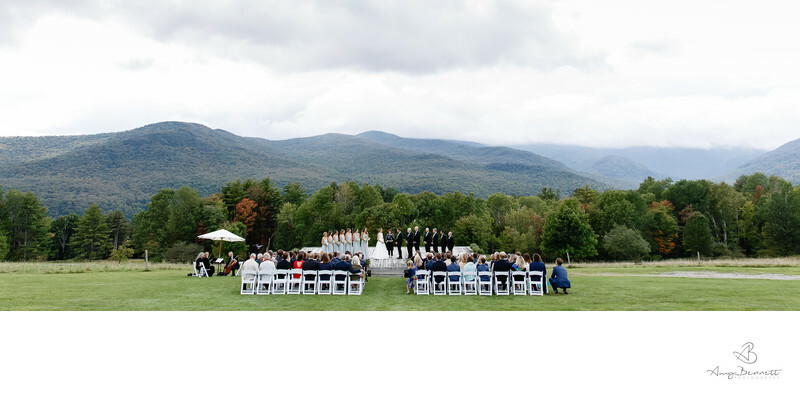 It has both indoor and outdoor venues, which makes the Trapp Family Lodge an excellent wedding venue irrespective of the season you may be having your wedding. With 96 comfortable rooms equipped with all the amenities and latest facilities, your wedding guests will be thrilled! The Trapp Family Lodge is simply gorgeous. At this Trapp Family Lodge wedding, the bride and groom were staying at the Green Mountain Inn, so we ended up having the getting ready photos off property! Natalie got ready with her sister, close friends from college and her wonderful mother. 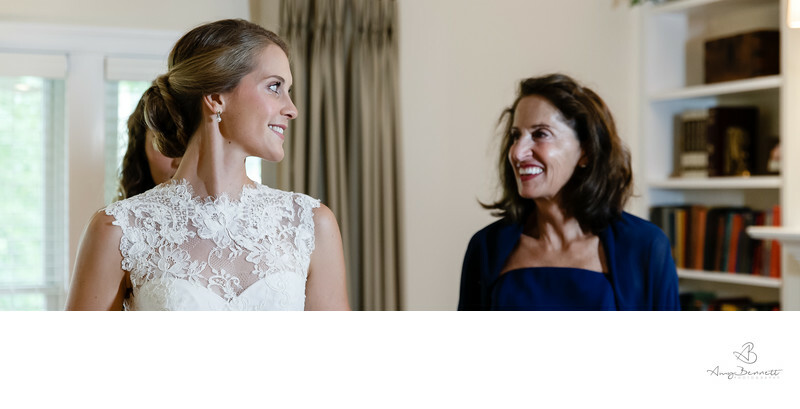 We created some beautiful getting ready photos and had some sincere mother and daughter and sister-sister moments. The Trapp Family Lodge even won the WeddingWire Couple's Choice Awards for two years in a row. From my standpoint, there are tons of reasons for this recognition. 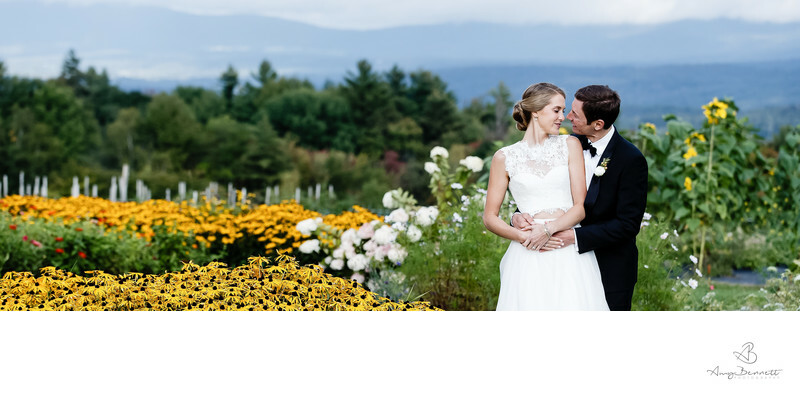 From offering delicious catering services, bar services, five stunning event spaces and a super professional staff.The Trapp Family Lodge has all the makings of a perfect wedding venue. Here is one of the reviews of the Trapp Family Lodge. Clients praise this incredible wedding venue for its beauty, elegance, and historical importance. If you read the review, clients were blown away by the service and attention to details. Oh, and it seems the food is pretty spectacular too! It's an excellent idea to spend some time on wedding review sites like The Knot and Vermont Brides. You have the opportunity to hear directly from the brides and grooms what their experience was with the staff. This is an integral part of the wedding planning process. I shot this photograph with a canon 1dx. A 70-200 mm lens with natural light. Location: 700 Trapp Hill Rd, Stowe, VT 05672.